Performance, cost, and simplicity makes Qumulo ideal for institutions engaged in cutting-edge research. Modern imaging techniques are an essential part of cutting-edge research. These imaging techniques offer many technologies: microscopy, magnetic resonance imaging, mass spectrometry, X-ray imaging, radar imaging, ultrasound imaging, photoacoustic imaging, thermal imaging, and imaging from telescopes and satellites. All of these techniques produce large amounts of file data and put tremendous demands on an organization’s file storage system. In one study, a group of researchers used electron microscopy and Qumulo to create a map of all the neural connections that exist in a rabbit retina. Thin slices of the retina were scanned and then digitally assembled into a high-resolution, 3D image. Researchers, who are always under pressure to publish their results, needed to quickly process these images for analysis. They also required that they could rotate and section the final 3D model in real time. Both of these activities required that the storage system serve up data fast enough to constantly feed the compute pipeline. Learn how researchers at the Scientific Computing and Imaging Institute (SCI) at the University of Utah use Qumulo to cut their processing time from months to days. Qumulo’s file system is a modern, highly scalable file storage system that runs in the data center and in the public cloud. 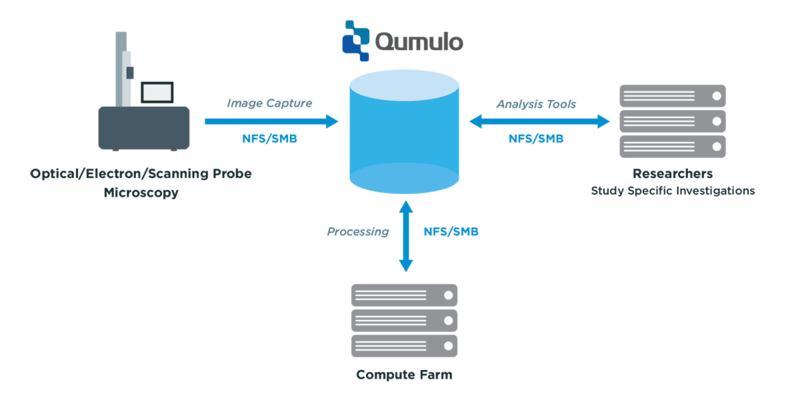 Qumulo handles large and small files with equal efficiency and can scale to billions of files. Its performance, cost, real-time visibility and simplicity make it ideal for institutions engaged in cutting-edge research. Researchers want to view images in real time, and are sensitive to latency. Viewing images, especially 3D images, can require many random reads from a large file. Qumulo provides two times the price performance compared to legacy storage systems. Qumulo costs less and has lower TCO than legacy storage appliances. Its advanced file-system technology means that 100% of provisioned capacity is available and not just the 70% or 80% that legacy storage systems recommend. Qumulo’s real-time visibility and control are extremely useful for managing research imaging workflows. With Qumulo, it’s easy to find the I/O hotspot and stop the process. With these tools, administrators can give researchers realistic numbers when they include storage costs in their grant applications. From the moment Qumulo is unboxed to when it can start serving data is a matter of hours, not days. Qumulo for AWS has almost instantaneous setup! Once the system is running, the student help desk or junior staff can manage it. Here is an example of a research imaging workflow. The images generated by the microscope are transferred to the Qumulo cluster. Processing occurs on the compute farm and, at the same time, researchers can carry out their analyses on their own workstations. Qumulo performance ensures concurrent access of the data by researchers and compute resources.